Everyone is talking about it, and every company is striving to get the best out of online marketing. While the concept presents a vast potential to the modern businesses, a vast majority of the companies are yet to crack the codes required to spur their endeavors to full function. The tools are many, and the rules of the game keep changing, but how do you go about it? It is a question whose answer lies within the limits of your teams’ imaginations, and the tools available to make it happen. A vast majority of the companies start at the website and later move on to other channels. With numerous social media networks available, it’s hard to wish away the vast potential that they can achieve through social media. It’s a top or perhaps the only platform where your brands can engage with clients, as you target specific groups based on their interests. While it helps to generate authentic and relevant content, the ability to choose when to post it and the frequency affects the bottom-line. Content generation must be organized to give the desired social media presence which accords trust on your brands. Developing a strong social media presence gives you an unbiased endorsement for your brands attracting more buyers to your business. While you could be tempted to make emotional posts to reach your target crowd, it helps to keep it within the hours when your readers are most active on social media. You, therefore, have to study and understand the clientele habits to capture them at that particular moment when they are online and perhaps looking for such information. Numerous studies have shown that customer engagement varies with the time of communication, hence the need for marketers to act proactively and reactively towards the readers. Previously, companies found it hard to plan on regular posts for the content to get maximum exposure. With numerous social media campaigns ran across different networks, it became clear that one can use scheduling tools to maintain a perfect flow of content on the social media sites. When it comes to content posting schedules, no one has shown signs of beating buffer with regards to the ease of scheduling. Marketers have an option to begin the social media campaign using the free versions that allow 10 social updates every moment, or perhaps increase the coverage through the paid option for unlimited scheduling. In the event, that you cannot develop content in good time, you can take advantage of the instant social updates, for your profiles as you put your function in order. While the updates link to news emanating from your industry, users have to take only what is relevant to the business, as at times it can be irrelevant. Users can operate the tool through applications, browser extensions, androids, and iPhone apps among others. It features a time-saving bookmarklet that allows you to create updates whenever you come across interesting yet relevant issues. You just click on the bookmarklet, and it develops the updates that entail URLs and the page titles. Other than the ability to add a personal touch to these updates, you can create a predictive plan for continuous promotion at predetermined optimum times. If you are using different accounts on the listed sites, you can share content promotions to multiple accounts through the additional tab on your profile as you create the post. The best of it is that all the features works for all the above social media platform and in equal measure. As many users turn to twitter for the daily updates, marketers have followed suite to capture the interests of the ever-growing platform. Twitter updates are short and traditionally hard to change hence making it difficult to adjust information once posted. With Social Ooomh, comes the ultimate solution to those wishing to improve posts when they go live. Similarly, it allows marketers to create alerts for specific keywords that emails a report on the rate of usage every 24 hours. The unique feature could be useful if you want to know whether online visitors discuss your brand, as well as if they like the kind of engagement that comes with it forthwith. As if not enough, it allows you to shorten the URL and track the number of clicks generated by the tweets you post. If you are not happy with the old posts, you can erase the history by deleting tons of messages or deleting previous tweets from the accounts on a single click. The feature helps when you need to refresh your feed without losing any follower. Perhaps one of the biggest players in the social media campaigns execution, the app entails a variety of tools that help users to post, track as well as evaluate performance on the medial social platforms. The device provides a free version that allows a single user, hence only suitable for small enterprises taking baby steps towards growing social media presence. If you have been spending hours on the daily updates, you can now save them in template form by just changing specific data as opposed to creating an entire post. When it comes to scheduling, nothing beats the Hootsuite intelligent feature- auto schedule- that automatically selects the posting time based on the history. The function analyzes the previous updates and chooses a time when your posts are likely to gain maximum exposure. The feature can also prevent similar updates running on multiple accounts if you are operating on several accounts. While you can set reminders on the scheduling intervals, the tool provides a unique feature that helps you schedule the posts as you browse for vital information. The Hootlet resemble buffer’s bookmarklet hence able to seamlessly plan for posts to pop in at the optimal times. Also, you can use Hootsuite to monitor twitter hats, while adding streams that help analyze each tweet via specific hashtags of your choice. You probably didn’t see it coming that Facebook doubles as a social media site, as well as a scheduling platform. A vast majority of the users make posts oblivious to the fact that they can schedule the posts for the optimal times. Unlike major social sites, Facebook provides a rich platform where companies can devolve their campaigns based on specific demographics. The data is extra particular about age, profession, geographic area, gender as well as academic qualifications. Other than the primary function of giving your brand unmatched exposure, the site allows users to plan unlimited updates made within the standard post updates of the pages. With that, businesses can delve into the campaigns by selecting specific times they want the posts to go live, one that best coincides with the target clients. You can enjoin with the Facebook insights which provide valuable information on the user engagement, response, and interactions with the previous postings. As your company grows, the focus shifts from customer acquisition to increasing the conversion rates and enhancing brand dominance. 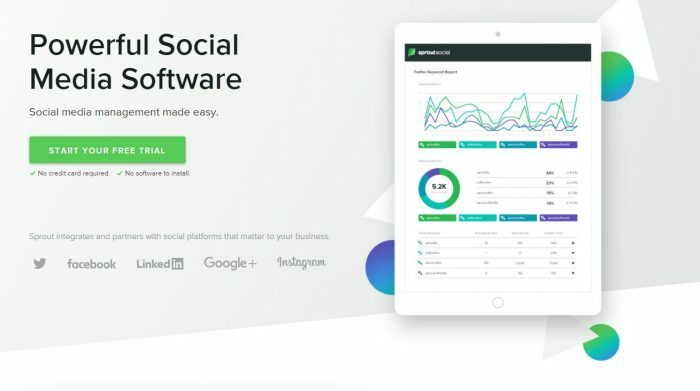 Without a free edition, sproutsocial works best for larger entities keen to track social media campaign performance. The tool is known to bridge Facebook, Twitter and Google+ while providing a comprehensive analysis of the traffic demographics and the level of interaction. You can use the tool for scheduling. Unlike the traditional marketing, you need more than one strategy to succeed in digital marketing. A successful social media campaign requires a combination of tools and strategies deployed to best capture the interests of the audience. If you are already using the buffer, it could be time to blend with Tweriod for your post scheduling. Small start-ups can start with the free version that limits analyses to 1000 follower before they can take up the paid edition that gives unlimited reports of the accounts.